The best cowboy poetry comes from real life, and Ron Wilson has been there. Ron Wilson grew up on the Lazy T Ranch near Manhattan, Kansas, where the family raised cattle, horses, hogs, wheat, corn, milo, and kids. He was active in 4-H and FFA, and was Kansas FFA president and national vice-president of FFA. He graduated from Kansas State University with a degree in Agriculture Education with an animal science specialty, and then earned a master's degree in Mass Communications. After graduation, Ron became a legislative assistant to Senator Nancy Kassebaum in Washington D.C. He next served as a staff member for the U.S. Senate Committee on Agriculture, Nutrition and Forestry and then as vice president of the National Council of Farmer Cooperatives. In 1985, he returned to Kansas to become a vice president of the Farm Credit Bank of Wichita. Since 1990, he has served as Director of the Huck Boyd National Institute for Rural Development at Kansas State University. 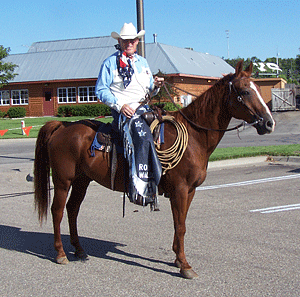 Riding in a parade on his quarter horse gelding. Ron produces "Kansas Profiles" a weekly newspaper column and radio broadcast, produced by the Huck Boyd Institute and distributed statewide on online. The program focuses on positive recognition to the state's rural leaders, and sharing ideas which may help rural people help themselves. Ron has performed at the American Royal, the National Agricultural Hall of Fame, Old Cowtown in Wichita, the Prairie Rose Chuckwagon Supper, the Kansas Museum of History, the Peace Treaty Pageant in Medicine Lodge, the Prairie Days Festival at the Little House on the Prairie, the Red Rock Guest Ranch, Governor Sebelius' Inaugural Family Festival, the Echoes of the Trail in Fort Scott, the Academy of Western Artists national gathering in Fort Worth, TX, the National Multicultural Western Heritage Museum, the National Cowboy Poetry Gathering in Elko, Nevada, and more. 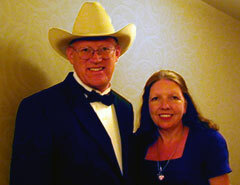 His column, "Cowboy Up" appears regularly in the Grass & Grain newspaper and his poetry is featured weekly by the Country Parson on WIBW Radio, 94.5 FM. He has performed on national television on RFD-TV. Ron is also a life member of the Kaw Valley Rodeo Association and a founding member of the Bibles and Boots Chapter of Cowboys for Christ. In 2010, he was named Ambassador for the National Multicultural Western Heritage Museum. Ron likes to say he's been " a 4-H member, FFA officer, farm radio broadcaster, college lecturer, Congressional staffer, association executive, rural development director, corporate vice-president, small business co-founder, rodeo ticket-taker, Sunday School teacher, diaper changer, bottle washer, tractor driver, posthole digger, thistle chopper, haybale stacker, fence fixer, calf holder, manure scooper, and tail twister." 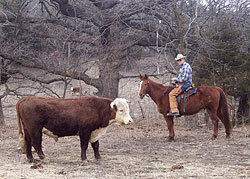 Ron and his wife Chris have 4 children, who are the third generation of their family to live on their historic ranch.